Here’s the next quiet book page for Jax’s book! I knew I wanted to do a tree and owl page, but it wasn’t going to be the next one I made. When Amazon happened to suggest this Skip Hop Treetop Friends Soft Activity Book , I was inspired! The tree and leaf style is based on that book. 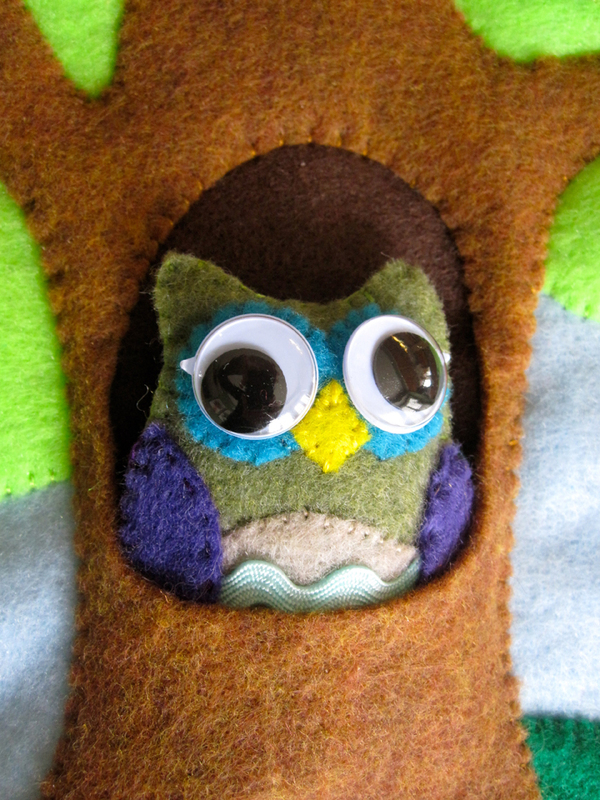 The owl is made from a free pattern found on Juicy Bits. I shrunk the pattern a little so I’d have an owl just under 2″ wide and 3″ high (I shrunk the page from 8.5″ wide to 7″ wide before printing), and I attached a 8″ ribbon into the bottom instead of making an ornament loop. 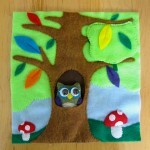 The page features a stuffed owl who lives in the tree trunk pocket. He is attached by ribbon so he doesn’t get lost. In the tree under a flap, lives a little bluebird in a nest. 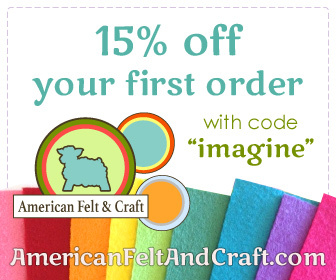 I started with a light blue 9″ square. If your page is a different size, you’ll need to adjust the lime treetop and the green grass – both go to the edges of the page. 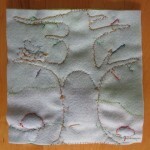 I stitched down the grass and the treetop first. Then I layered the tree trunk over the dark brown (stitching the other end of the owl’s ribbon down) and stitched all around the whole trunk. For the hole, I only stitched down the upper 1/3. 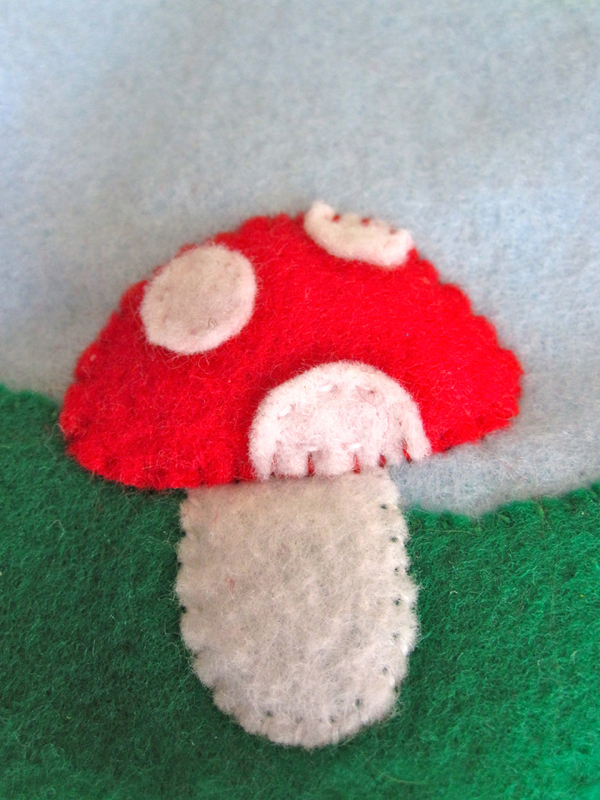 I sewed down the toadstool stems next. The polka dots were stitched onto the caps, then the caps sewn down with some batting for dimension. The little bird’s wing was only sewn on where it attaches to his body. 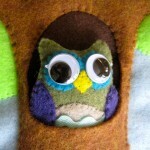 His eye is a French knot and his beak was satin stitched. 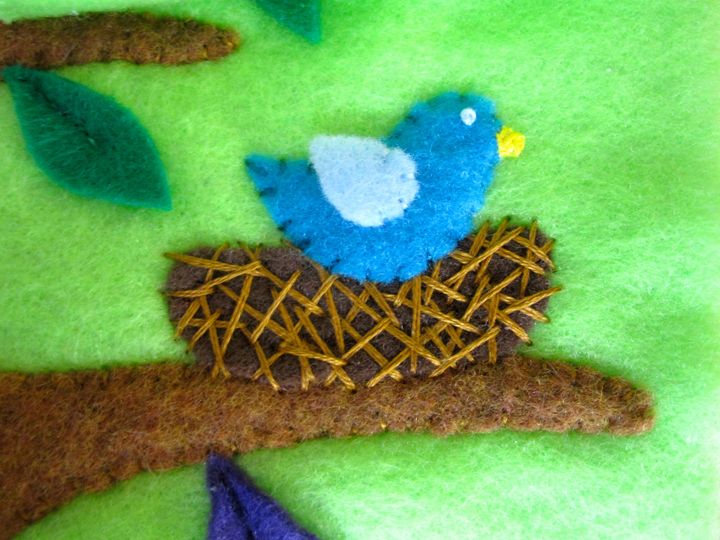 I sewed down the nest with helter skelter straight stitches then sewed the bird into his new home. The leaves were all attached by doing a running stitch down the center for about 1/3 – 1/2 of the length so they stick off the page a bit. 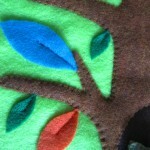 On the tree flap, I sewed the two leaves to the front piece, then sewed front to back with a loop of ribbon. The final step was to sew the flap on. I didn’t sew around the edges of the page because it will be machine-sewn to the fabric book page eventually. For more free quiet book patterns, go here! If you use this pattern, please add a comment or link to me. I really would love to see your version! 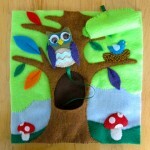 This entry was posted in Crafts, Quiet Book, Sewing and tagged Quiet Book, Sewing on September 16, 2011 by Stephanie. Did I mention I love these books? Cuz I do. Crazy adorable! I wish they made quiet books for grownups. What kind of glue did you use to attach the eyes? Have you had any problems with them falling off? I believe my eyes were adhesive and I also added tacky glue. He hasn’t tried to get them off and they haven’t fallen off yet! I finished this page -my very first, and first time using felt too- last night, and it’s beyond adorable! 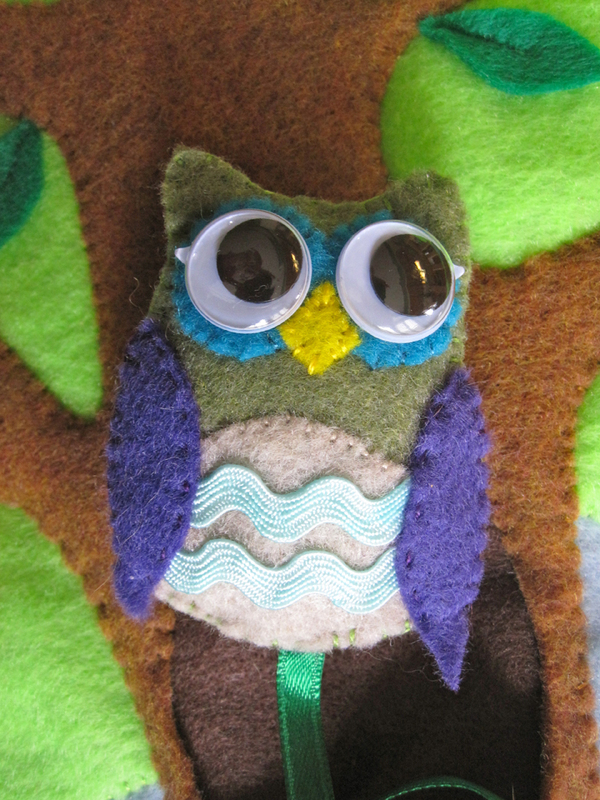 I have only basic sewing skills, so after the owl took 2hrs by hand I went with the machine for the rest of the page and knocked it out in 30 min. I’m incredibly impressed with your creativity on all these pages and can’t wait to do some more. Thanks for sharing! I just made this pattern, I love it!! I changed a few things. I made the bird a snap element as well as the leaves a color matching snap element. 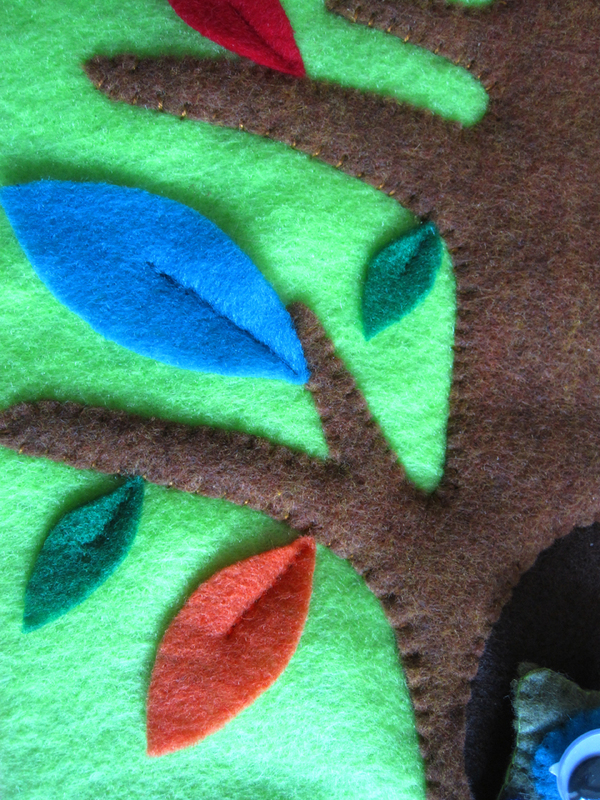 I think I am going to add a basket to the page or make the other page a basket to put the leaves in. Thank you so much for posting these patterns!!! I love all you amazing ideas! I love your adorable pages! This was the first one I’ve made and I put up some pics here at http://flamesanddragonflies.blogspot.com/2013/01/woodland-page.html so you can look at my version if you want. Thank you so much for sharing! WOW! I SALUTE your creativity! I just stumbled upon you on Pinterest and you’re nothing short of amazing. I’ve repinned so many of your Quiet Book pages now, not really having any illusion I’ll make them all or even half as nicely as you have. But they’re amazing and so much fun to look at. All I can say is – WOW! I am in process of making this page but can’t get the tutorial on Juicy Bits. Do you have one you could share? Love all your quiet book pages, have made several. Thanks. Love your quiet book ideas! I tried to print the pattern, but noticed that the sizing was off. I printed the PDF with the “Fit to page” box checked off but the pieces (like the tree and big background leaves) came out bigger than 9 inches. Is there something I’m doing wrong with the printing? Or maybe I’m misinterpreting the pattern. This is going to be my first quiet book page I’m attempting. Thanks for your help! Ahhh! I just figured it out! Sorry, Stephanie! 🙂 For people who run into the same issue, here is what I did: 1) Download file. 2) Open in Adobe Reader (just printing directly from clicking on the pattern and from the browser print screen didn’t work for me for some reason). 3) Click on the Print icon 4) Make sure the “Page Sizing and Handling” setting is set to “Actual size” and NOT “Fit” (that’s what was tripping me up). Yay! Can’t wait to get started on this page! You beat me to answering! Yes, my patterns are size to print “Actual Size”. I made your forest page, almost exactly, minor changes, but then it gave me confidence to create my own. I ended up designing 9 pages and had heaps,of fun, it took forever as I hand stitched everything and it was painful not having a pattern, but tomorrow I finally get to give it to my first grand child. Thanks for the inspiration, your books are amazing. I love when others get inspired to make their own creations! Thank you for sharing your experience! I can’t seem to find the link to download the pattern? (I tried to cut and paste the pattern, but the size was wrong). Can you help? Thanks so much! Thanks so much Stephanie! Your patterns are clean & crisp, but also have cute details…by far the best quiet book patterns out there! I started on making a quiet book in 2012. I’d always wanted to make one but am not much of a sewing person. I found your site and made the forest page. Since then I have created my own pages, mostly, but I wanted to thank you for getting me started. My first book is being enjoyed by my first grand child who is 14 months and my second will be for my new grandson who is just 6 months, so I have a little time. My pages are much simpler than yours but I am completely addicted to making them I’m not as quick as you but it is coming together nicely, I wanted a link to the first book so I’m back for the tree with the birds nest. I couldn’t remember what it looked like. Anyway, I just wanted to thank you and Jax for inspiring me to get creative. I made a sheep shed with sheep that have removable fleece which is a hit with my grand daughter as she lives on a sheep farm in The Western District here in Victoria, Australia. Quite proud of that one. My pattern was a photo of the real shed. Thanks again Stephanie. Thank you for your sweet note! Instagram - I respond to comments often! Facebook - Turn on "Get Notifications" in the Like button to never miss a post. Pinterest - Currently pinning Jax's party ideas. Unless credited otherwise, all photos, patterns and content on this blog is © Stephanie Segall 2011 - 2019. All projects are for non-commercial use only, unless stated otherwise. Visit my Etsy shop if you wish to purchase a license to produce a project for sale. You are welcome to feature my work on your blog, but I require a link and credit back to the original project. You may use a photo or two, but please do not post my tutorials or patterns. 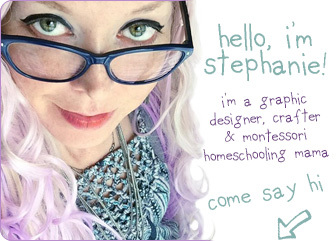 Contact me with any questions or for a custom blog feature. Enter your email address to subscribe to this blog and receive new posts by email as soon as they go live! Some posts may contain affiliate or advertiser links. Read our full disclosure policy here.